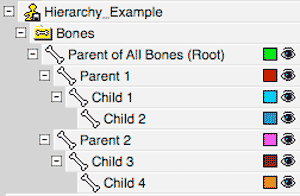 An example of Bone Hierarchy in the PWS. We’ll look at this example at the end of this page. This section is about “Bone Hierarchies”. Bone Hierarchy is often referred to as the “Parent-Child” relationship. Each section of this tutorial so far has been important but this particular section is what I consider the most important. This is the part that we need to “get” before anything else can be understood about rigging. There is no need to worry though because this part may be one of the easiest aspects of rigging to understand. 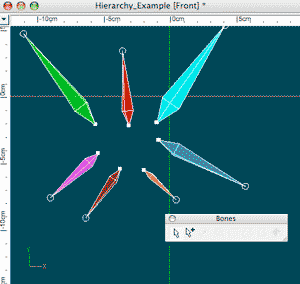 Bone Hierarchy is a system that designates that one bone is “in charge” of another bone in a layout. This really means that when one bone is moved, any bones that it is in charge of also move in relation to it. The bone that is in charge of another bone is called a Parent. The bone the Parent is in charge of is called a Child bone. A Parent bone with one or more children is often referred to as a Branch. A Child bone can only have one bone that is its direct Parent but a Parent bone can have as many Child bones as you want to add to it. Let’s say that a man is sitting at a desk that has a book resting on it. The man decides to reach for the book. In order to do this the man will need to raise his arm and extend it so that his hand can grab the book. In this example, the man’s hand is the child of his arm since his hand was dependent on the arm positioning itself in order for his hand to be in the right spot to pick up the book. You can dissect this example further by understanding that the man’s forearm is the parent of the hand and his upper arm is the parent of his forearm. Bone Hierarchy is important because understanding and utilizing this system will help to make manipulating your rig a more intuitive and efficient process than not using the knowledge of this system to your advantage. In other words, it would not make sense to have to move the man’s thigh bone in order to move his forearm so that he could grab the book with his hand. That could happen with if Bone Hierarchy is not taken into account when setting up a rig. If you had to do it that way then you would probably have a very strange looking animation. 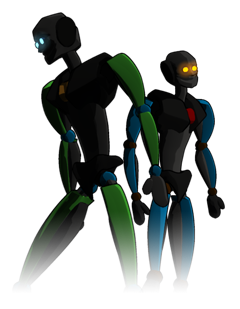 With that example in mind it will help to set up a Bone Hierarchy that somewhat resembles an arm in real life. Back to our “Bones_Tutorial” Model window. Ok, it’s time for me to show you what I am really talking about now. 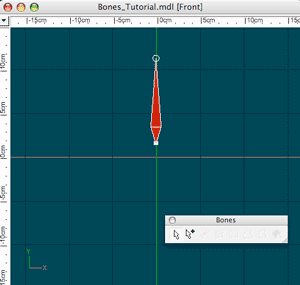 Let’s go back to the Modeling window for the “Bones_Tutorial” model where we have created that single bone. For now, don’t worry about having your Action window up now because we are going to focus on the bone layout for now. How do we set up a Parent-Child relationship with our bones? Well, first we need to have at least two bones in order to establish one so we need to add one more to this model. We can make the new bone a child of “Bone1”. We can make the new bone an equal to “Bone1” in the hierarchy (Meaning that moving one bone in an Action window will have no effect at all on the other bone). We will make our new bone a Child of “Bone1” in this example. Added a new bone. Notice the offset in the PWS. 1. In the Modeling window (Bones Mode), select the bone that you want the new bone to be the child of. The selected bone will now be active (flashing) in the Modeling window and its name will also be highlighted in the PWS. 2. Now draw the new bone in the modeling window. You will notice that the new bone is named “Bone2” in the PWS. More important than that, you will see in the PWS that “Bone2” is located directly below “Bone1” and offset slightly to the right of “Bone1”. This offset is the indicator in the PWS that “Bone2” is a child of “Bone1”. The PWS is the only place that maps out the hierarchy for you to see and organize. The Modeling window does not illustrate the hierarchy. Added a new bone. The bones are not offset from one another in the PWS which means that they are equal to each other in the hierarchy. Drag “Bone2” on top of “Bone1” in the PWS. “Bone2” is now a child of “Bone1”. Notice the offset in the PWS. The key here becomes apparent in step #2. You can see in the in the first image on the left that “Bone2” is below but not offset slightly to the right of “Bone1” in the PWS. They both share the same margin. At first glance doing it this way may seem to be slightly less efficient than method one but it comes in handy later on when you are working with rigs with a very large number of bones or you just want to lay the bones out first. As you may have noticed in Method 2, you can restructure your bone hierarchy from within the PWS by dragging and dropping bones. The way to do this is simple. In the PWS simply drag the bone that you want to become the Child, over the bone that you want to become its Parent. Do all of that in the “Bones” folder of your model in the PWS and not in the Modeling window. This gives you great flexibility to edit your bone hierarchy if you ever decide that you need to rearrange it to correct something or to try something different. This example shows a lot of bones. Can you understand the hierarchy…? Let’s take a look here at a slightly more advanced bone layout and hierarchy. This is just a bunch of bones laid out in a model window, not something that you may really come across. 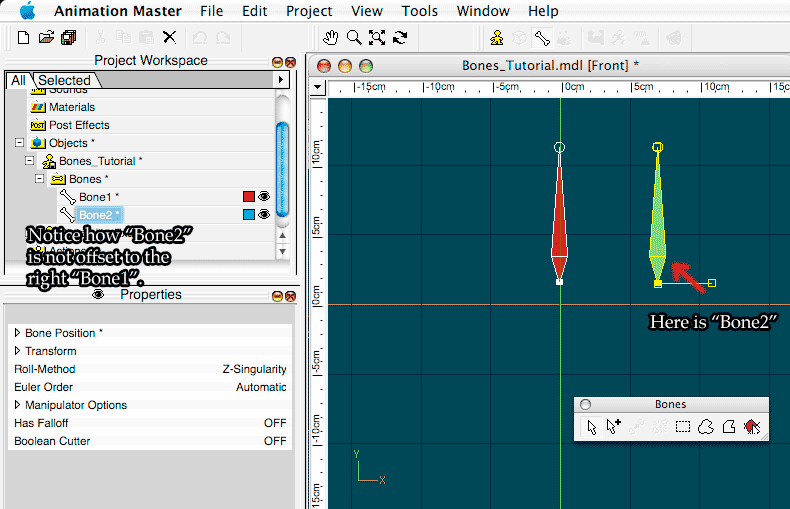 Can you tell what the bone hierarchy is of the model by looking at the bones strictly in the Model window? No, you can’t. You will need to view the bones in the PWS to find out what is going on. You can only see the the structure of the hierarchy by examining the PWS. This is the actual hierarchy of the model above. I have named the bones here so that we can have a better understanding of how this is structured just by reading the names that I’ve given to the bones. Let’s take a look and break this simple rig down. The bone named “Parent of All Bones (Root)” is the Root bone or top Parent in this model. There are two bones that are immediate children of “Parent of All Bones (Root)”. The Child bones to “Parent of All Bones (Root)” are “Parent 1” and “Parent 2”. “Parent 1” is its own branch. “Parent 1” has a Child named “Child 1”. “Child 1” has a Child named “Child 2”. “Parent 2” is its own branch as well. “Parent 2” has a Child named “Child 3”. “Child 3” has a Child named “Child 4”. Did you think that “Parent 2” was also a child of “Parent 1” when you looked at the PWS? If you did, don’t worry since it’s easy to see it that way when learning about how the bones are visually structured in the PWS. The key here is to remember what we learned moments ago with bones being below and slightly offset to the right of the Parent bone. Sometimes it helps to collapse the layout in the PWS (by clicking the minus sign next to the bone) in order to get a better understanding of the structure. …So let’s do something about that and make it easier for ourselves. You can collapse any bone that is a parent to another by clicking the minus sign that is to the left of the bone. This will minimize the confusion by hiding its children in the PWS (Doing this comes in handy for minimizing long branches such as an animal’s tail). You can expand the display again by clicking on what is now the plus sign to the left of the bone. When we collapse the bones “Parent 1” and “Parent 2” it becomes much more apparent that they are both children of “Parent of All Bones (Root)”. “Parent 2” is below but not offset slightly to the right of “Parent1”. They both share the same margin. This makes them equals in this branch of the hierarchy. OK, now we’ve learned how to create and rearrange a simple hierarchy, lets see how a hierarchy actually affects bones.